She calls me "Mama Leisha": "Bee Nice" Banner and 25 Shmacks! "Bee Nice" Banner and 25 Shmacks! You guys, I am constantly harping on my kids to "use kind words." You'll hear me say stuff like: Be kind! Be sweet! Be nice to each other! Be nice to everyone! My daughter is a sassy pants and likes to call her brother a weirdo; my son has an autism spectrum disorder and has a hard time understanding why he can't call people "Donut Heads." It's a battle, I tell you! The moment I walked into The Wood Connection and saw their brand new, adorable little bees, I knew exactly what I wanted to do for my guest post for them. 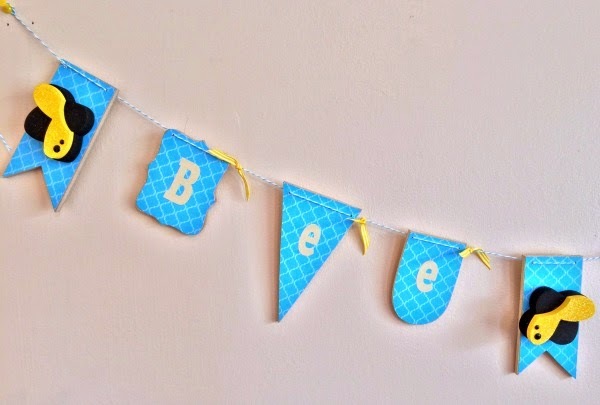 A "Bee Nice" banner! If you would like to read my full tutorial, you can do so here. It's adorable and it's "message" is important. I think you'll like it! The Wood Connection has graciously donated a $25 gift certificate to be given to one lucky and "nice" Mama Leisha reader. Entering the drawing for this ultra fab prize is easy! Simply leave a comment below! The winner will be selected at random and notified via email APRIL 14th. Always remember to "Be Nice." Or, "Bee Nice." Whichever! I would love to win this and get in there to check out their spring decor! Thanks so much!! i love this banner, those bees are so cute. we love honey bees at our house, so those bee are definitely going to be making an appearance at our house! i love the banners the wood connection carries, they are one of my favorite things and it seems like i buy them every time i go there! Love this! So cute! I need to make one to remind my kids! So cute. Love this idea. I am terrified of bees, but these ones are actually cute :) and now I need to go to the Wood Connection and see their paper line!!! Awesome idea! Super cute! Gonna have to add this to my craft to do list! Cute!! I too am constantly reminding my kids to "Bee Nice" to eachother!�� LoVe the wood connection!! Oh Leisha. This is simply the cutest banner ever. You are amazing crafter and I love, love, love this reminder to Bee Nice! I think my girls could use it, too! And The Wood Co has their own paper?! Bee still my soul! I love this! I've been trying to use virtue words with my kids and this would be a great reminder for all of us! Oh my goodness that banner is bee-utiful!!! I could use this reminder in my house 24/7!! This is a great idea. My boys could use this message as well. Thanks for the giveaway! This is so cute! I'd love to win so I can get some things to decorate my girls' rooms!